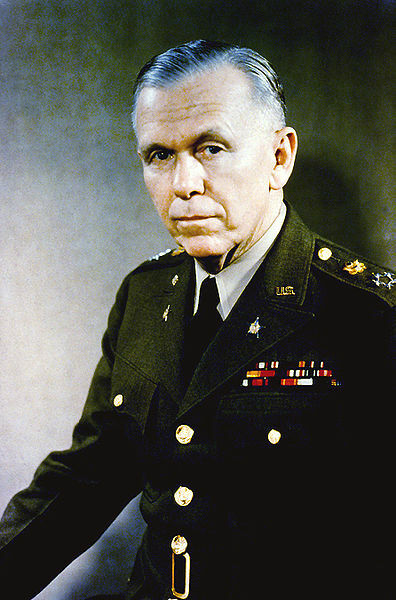 George C. Marshall was born in Uniontown, Pennsylvania, on 31 December 1880. He graduated from the Virginia Military Institute in 1901; the next year, he married Elizabeth Carter Cole. Marshall was commissioned a second lieutenant in 1902 and served with the 30th Infantry in the Philippines for the next two years. In 1907, he was promoted to first lieutenant and graduated from the Infantry and Cavalry School. He was a student, and then taught at, the Staff College from 1908 to 1910. From 1913 to 1916, Marshall was assigned to the 4th Infantry at Forts Logan H. Roots and Crocket; he then served a tour with the 13th Infantry in the Philippines. In 1917, he was promoted to captain, and then to temporary major. In 1918, he was promoted to temporary lieutenant colonel and temporary colonel. During the First World War, he served with the American Expeditionary Forces in France as an operations officer of the 1st Division and the First Army. Later he was assigned as the chief of staff of the VIII Corps. Marshall participated in the Cantigny, Aisne-Marne, St. Mihiel, and Meuse-Argonne operations. He also served as an aide to General John J. Pershing after the war. In 1920, Marshall was made a permanent major; in 1923, he became a permanent lieutenant colonel. From 1924 to 1927, he led the 15th Infantry in China, and then was an instructor at the Army War College. He then served as assistant commandant of the Infantry School until 1932. In 1930, he married Katherine Boyce Tupper Brown. Promoted to full colonel in 1933, Marshall commanded the 8th Infantry until being reassigned as the senior instructor of the Illinois National Guard from 1933 to 1936. In 1936, Marshall was made a brigadier general and led the 5th Infantry Brigade. In 1938, he became the head of the War Plans Division, General Staff. From 1938 to 1939, Marshall was the deputy chief of staff of the Army. In 1939, he became the acting Chief of Staff. In September, 1939, Marshall was promoted to major general, and full general. He served as the Army Chief of Staff from 1 September 1939 to 18 November 1945. As Chief of Staff, he centralized the professional leadership of the Army in the Chief of Staff’s office, urged pre-war mobilization, coordinated wartime industrial conversion, streamlined administration, oversaw grand strategy once the U.S. entered the Second World War and was the principal American architect of Allied victory. In 1944, he was made a temporary General of the Army, a rank made permanent in 1946. After the war, Marshall served as President Harry S Truman’s personal representative to China, until 1947. He retired from active service and became the Secretary of State until 1949. In 1948, at the commencement speech at Harvard, he urged a program of European economic recovery, which became known as the Marshall Plan. In 1949, Marshall was recalled to the active list and was the president of the American Red Cross from 1949 to 1950. Marshall then served as the Secretary of Defense until 1951. He was awarded the Nobel Peace Prize in 1953 for the Marshall Plan. Marshall headed the American Battle Monuments Commission from 1949 to 1959. He died in Washington, D.C., on 16 October 1959.